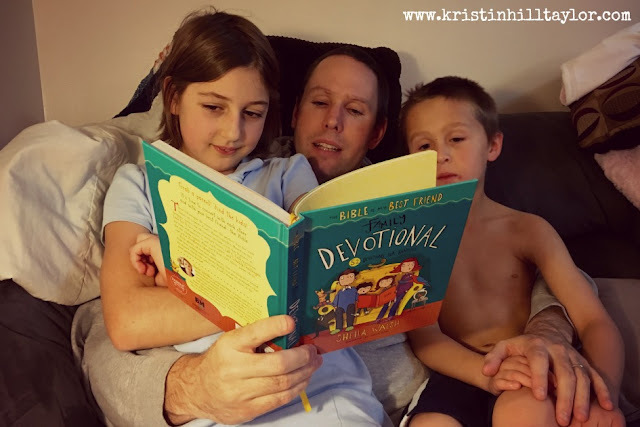 Each evening looks different, but Greg and I like to incorporate family devotions into our lives with young kids. Depending on the day, our kids, and the season in our lives, we use various different devotions. Cate also has a couple she reads on her own before bed. Right now, the newest family devotional on our shelf … or, well, on the arm of our couch, or kitchen table, or wherever it was left … is Sheila Walsh’s “The Bible is My Best Friend Family Devotional.” This brightly colored, hardback book has 52 devotions aimed at families with children 4 to 10 years old. I like that it has questions, discussion points, scripture to memorize, and challenges for kids who are ready to go deeper. The illustrations by Sarah Horne are also cute and cartoonish. Week 3 prompted a good conversation between dad and son about obedience. Using Noah’s obedience to God as an example, Walsh reminds families that obedience takes work, patience … and sometimes the ability to put up with a bunch of stinky animals. She also talks about how Noah’s obedience protected his family. Greg talked to Cate and Ben about how godly obedience translates into their daily actions in our home and in their obedience to us. That’s a conversation we could have had anytime, but it’s nice with the prompting comes through a book the kids are already enjoying. Books like this one help us parents speak truth in our kids’ lives. ABOUT THE BOOK :: From best-selling author Sheila Walsh, "The Bible Is My Best Friend Family Devotional" connects families both to God's Word and to each other. Fifty-two key scriptures form the basis for the devotions, which build on the verses, challenge the family to commit them to memory, and explore how each verse is part of God's wonderful message. "Let's Talk" questions urge the family to discuss what they've learned and offer challenges for different ages of children as well as their parents. Hardback. 224 pages. Published by B&H Kids (Oct. 1, 2015). ABOUT THE AUTHOR :: Sheila Walsh is a powerful Bible teacher and best-selling author from Scotland with more than 5 million books sold. Her international ministry has reached more than 5.5 million women by combining honesty, vulnerability, and humor with the transforming power of God’s Word. Calling Texas home, Sheila lives in Frisco with her husband, Barry, her son, Christian, and three little dogs. You can reach her at braveheartsisterhood.com. ABOUT THE ILLUSTRATOR :: Sarah Horne grew up in Derbyshire, England, where she spent much of her childhood scampering in the nearby fields with a few goats. Then she decided to be sensible and studied illustration at Falmouth College of Arts and gained a master’s degree at Kingston University. Now into her 14th year as an illustrator, Sarah lives in London and specializes in funny, inky illustrations and words for children’s books. I received a free copy of this book from B&H Publishing Group in exchange for a review, but these opinions are my own. We’ve used this book and it’ll continue to be found in random places around our house. This post also contains Amazon affiliate links.